"I fear we shall never see another Tozer. Men like him are not college-bred but Spirit-taught." Leonard Ravenhill, 20th century British evangelist. Pastor A. W. Tozer, author of the Christian classics The Pursuit of God and The Knowledge of the Holy, was a complex, intensely private, deeply spiritual man, and a gifted preacher whose impact for the kingdom of God is immeasurable. 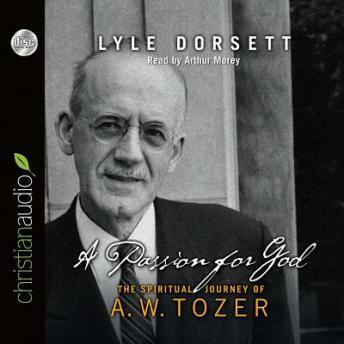 In this thoughtful biography, bestselling author Lyle Dorsett traces Tozer's life from his humble beginnings as a Pennsylvania farm boy to his heyday as a Chicago pastor--when hundreds of college students would travel to his South Side church to hear him preach and thousands more heard his Sunday broadcasts on WMBI. Eventually, he came to his final pastorate in Toronto. From his conversion as a teen to his death in 1963, Tozer remained true to one passion: to know the Father and make Him known, no matter what the cost. The price he paid was loneliness, censure from other, more secular-minded ministers of the times, and even a degree of estrangement from his family. Read the life story of a flawed but gifted saint, whose works are still impacting the world today.